Elecard StreamEye Studio is a set of powerful applications designed for professionals and prosumers in the video compression field. 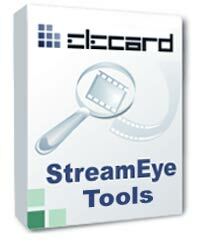 Elecard StreamEye Studio enables the user to perform an effective in-depth analysis of video sequences. Elecard StreamEye Studio is a set of powerful applications designed for media professionals and prosumers to analyze video quality, troubleshoot problems in the encoded stream for further video compression optimization and ensure compliance to the video standards. Elecard StreamEye Studio v.1.0 comprises Elecard StreamEye v.3.0, Elecard YUV Viewer v.2.1, Elecard Video QuEst v.1.0, Elecard Stream Analyzer v.2.0, Elecard Buffer Analizer v.2.0. Elecard StreamEye provides the user with a visual representation of the encoded video features and a stream structure analysis of MPEG-1/2/4 or AVC/H.264 Video Elementary Streams (VES), MPEG-1 System Streams (SS), MPEG-2 Program Streams (PS) and MPEG-2 Transport Streams (TS). Streams YUV Viewer is designed to view YUV data sequence in YUV video files, compare files against one another to find out if binary images match, and view the result of comparison. The application also allows the user to calculate quality metrics, such as PSNR, NQI and VQM. Elecard Video QuEst allows the user to calculate video quality metrics, such as PSNR, NQI, VQM and SSIM. It has been designed and implemented for reverse engineering and analysis. Elecard Stream Analyzer is a powerful tool designed for syntax analysis of encoded media streams and presentation of the analysis log in a human readable form. Stream Analyzer operates with MPEG-1 Video/Audio, MPEG-2 Video/Audio, AAC, AC-3 and AVC/H.264 files. Elecard Buffer Analyzer allows analyzing of the decoder video buffer parameters. Whether you are a multimedia application developer, codec writer, system engineer or QA team member, Elecard StreamEye Studio is essential for you to perform an effective in-depth analysis of video sequences.